PUTRAJAYA, 26 Jan. 2012 – The government today granted the National University of Malaysia (UKM) and four other research universities full autonomy. This followed an audit process based on the University Good Governance Code and Index (CUGG and UGGI) in four areas – institutional governance, finance and revenue generation, academic management and student admission as well as human resources. Higher Education Minister Dato’ Seri Mohamed Khaled Nordin presented the autonomy warrant to a representative of UKM Board of Directors, Dato’ (Dr) Megat Abdul Rahman Megat Ahmad and Vice Chancellor Prof Tan Sri Dato’ Wira Dr Sharifah Hapsah Syed Hasan Shahabudin at a ceremony here. The autonomy given to UKM in effect transfers decision-making powers from federal agencies and the ministry to the university. He regarded it as an important basis in efforts to empower the university in realising its agenda for excellence. The minister said the governance system based on autonomy involves a high level of integrity and accountability that needs to be observed by UKM. While he was confident that UKM is all set to assume this responsibility, he nevertheless reminded that the two basic principles should be the guide and yardstick for every action taken by the university management. He said that autonomy is a vital precondition in evolving a campus environment that is dynamic, via a university management that is more competitive, creative and flexible. Referring to UKM’s status as a research university, he felt that it should reduce the number of its undergraduate programmes as well as the students for them. “This needs to be done by taking into consideration the ideal ratio between undergraduates and graduates, coming up with relevant programmes so that these are feeders to postgraduate programmes that have a research thrust,” he added. 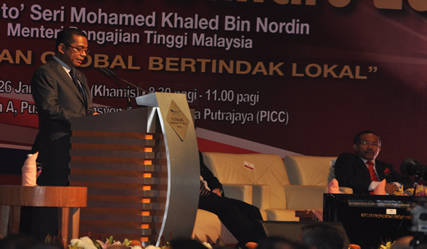 UKM has begun introducing the teaching of entrepreneurship throughout its curriculum in all years, and Mohamed Khaled stressed that efforts to strengthen this, either in inculcating an entrepreneurial mind or in generating entrepreneurs, are vital in improving the marketability of graduates as well as helping overcome the unemployed graduate issue. In introducing entrepreneurship in its curriculum, UKM is working closely with Stevens Institute of Technology in the U.S. The Minister said local universities should study the various new entrepreneurship models that are being worked on at institutions of higher learning all over the world in order to arrive at a partnership of best practices. Four other universities, Universiti Malaya, Universiti Sains Malaysia, Universiti Putera Malaysia and Universiti Teknologi Malaysia, were also presented with their autonomy warrants.